Panasonic is making big noises about 4K video and the 8Mp stills you can extract from it, so we caught up with Panasonic's Product Marketing specialist Mark Baber at The Photography Show to find out why this is such a big deal and why 4K is much more than just a high-end broadcast medium. We've spoken before, Mark, and you're obviously a kind of 4K evangelist, so what are you doing at The Photography Show? I am a 4K evangelist, and we're here to show people what it can do and explain away any misconceptions about the technology. So do you think people misunderstand 4K, that they think it's all too high-powered and way off in the future? Oh, absolutely. I think a lot of consumer electronics purchasers see 4K as a television, a camera or maybe a piece of broadcast technology they won't ever get to use because it's expensive. But you can now buy a Panasonic 4K 40-inch television for £600, so this is becoming mainstream technology. So the challenge is what you're going to watch on a 4K TV? We want to show people that if you're buying a new camera and you've got a 4K television, you could shoot content on your 4K camera and play it back on your TV with 4x greater information, 4x greater resolution. That's one argument. So you're saying that the average user doesn't have to worry about high-powered editing tools and computing hardware? You don't even have to get into that. You can play 4K straight from your camera into the television. Or, if you've got a 4K camera and a full HD television, you can connect via HDMI and still play back your 4K footage at 2K [1920 x 1080] resolution. The other thing that you're really pushing is that you shoot 4K video solely to get 8Mp stills, but a lot of photographers are going to think that it's just a novelty, that the quality won't be very good. This is a testament to the technology. 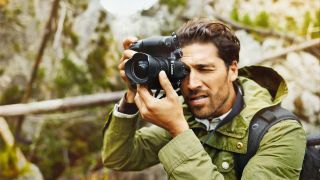 You've got four times more data from 4K over full HD and – this is comparing it to other Panasonic products – you've got better dynamic range, improved resolution, better grey tones, better colour, improved ISO performance, potentially, over stills. But the main message is that shooting at 4K allows you to shoot at 30 frames per second. The GH4, for example, shoots 16Mp stills at 12fps but, as you know, if you don't use the right card or you maintain the burst for long enough, then gradually, over a few seconds, this speed deteriorates and you've lost the moment. So the trouble with regular continuous shooting (burst) modes is that you run out of buffer space after a certain number of shots – and you can't always predict when you need to start shooting. No, you don't know when the action's going to start, and actually, that's a really good point. And there are things you can do with video while you're filming that you can't do with stills, too. When you're recording full HD, or 4K, or slow motion on a Panasonic camera – the GH4, for example – you can change the settings live. You can change the ISO, you can change the shutter speed, you can change the compensation while you're recording. You don't have to stop like you would in burst mode. Current page: 4K for all?